In a cruel August, when tragic news come one after the other on a daily basis, from Iraq to the Ukraine, from Syria to the Gaza Strip, few have paid attention to Nagorno Karabakh. Yet, what has taken place in recent weeks has been an unprecedented escalation, threatening to plunge Armenia and Azerbaijan into a new war and seriously endangering the precarious ceasefire signed in May 1994. Since the end of July, clashes in what is the most militarized area of Europe have occurred with increasing frequency, causing at least 20 victims, many of them very young. Given the absence of external observers, counting the casualties is quite difficult and figures provided by the two governments do not match. Propaganda had a prominent role in the events of the last few days. Clashes on the front line have increased steadily in recent months, including in areas traditionally not affected by the conflict, such as the border between Armenia and the Azerbaijani exclave of Nakhichevan, wedged between Armenia, Turkey and Iran. In addition to the sniper shots, which cause annually dozens of victims, in the last week raids occurred across the line. Apparently, these came mainly – but not exclusively – from the Azerbaijani side. This would explain the high number of casualties within their ranks: 13, according to the Baku government sources reported by the press (the Armenians say almost the double). Adding fuel to the fire – and contemporary with the military escalation at the beginning of the month – is the story of Karen Petrosyan. 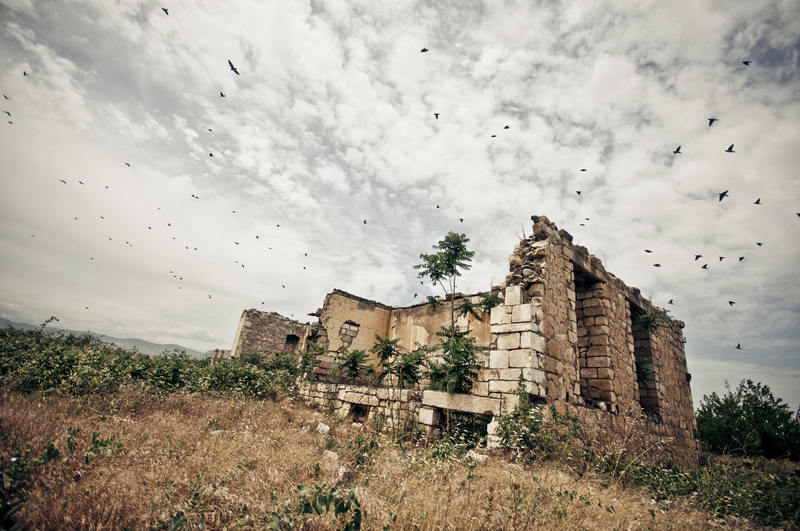 The man, a thirty-one year-old Armenian villager of Chinari, in the region of Tavush, on August 7 crossed the border and “under unknown circumstances” (thus the Armenian officials) reached Ağbulaq, in Azerbaijan. A person from the same village as Petrosyan said he went lost fetching wood, another that he was drunk, while for Baku he was just a saboteur and a spy. Yet, an interview conducted by Radio Free Europe/Radio Liberty with Farida Tagiyeva, the first person Petrosyan encountered after crossing the border, tips the balance in favour of the Armenian interpretation. According to Tagiyeva and other people of the village, the man, who had approached her asking for tea, was unarmed and in civilian clothes. As a proof, an amateur video depicts a bewildered Petrosyan answering questions in Russian made by the inhabitants of Ağbulaq. In what has been also a propaganda escalation, the same Petrosyan appears later in a video posted online dressed in military uniform, while he confesses to a senior military officer to be an agent. A large range of weapons are shown to prove the assumption. The next morning, Karen Petrosyan was declared dead by the Baku Ministry of Defence, officially “due to an acute heart and lung failure.” The Armenian authorities, who are convinced that the man was tortured and killed instead, asked an autopsy of the body of Petrosyan by an independent panel of international experts. No less alarming was the bellicose rhetoric displayed by the authorities in Baku. The Twitter profile of the Azerbaijani President Ilham Aliyev has been filled on August 7 by a remarkable series of threats, accusations and boasts of military superiority directed against the “Armenian barbarians and vandals”. On the following day, there was a statement by the Defence Minister Hafiz Heydarov, who said he was ready, if necessary, to destroy the Armenian capital Yerevan with its missiles. It is no coincidence that together with the military escalation and rhetoric, there has been an unprecedented wave of repression in Azerbaijan. An essential factor in the dynamics of the Nagorno Karabakh conflict is the use that the dictator Aliyev and the Armenian oligarchs make of it, to justify the unlimited economic and political power they have in their own countries. Thus, on August 5, the sociologist Arif Yunus was arrested on charges of cooperating with the Armenians. Just a few days before also his wife, the human rights activist Leyla Yunus, had been sent to prison, while another activist, Rasul Jafarov, was arrested on August 2. This led to the remarkable number of 97 political prisoners locked in Azerbaijani prisons, according to a list published on August 8 by 12 NGOs and a team of lawyers, on the basis of the work done by Leyla Yunus and Jafarov. A list that would already require a further extension, given the subsequent arrest of Intigam Aliyev. Drawing a clear connection between these arrests and the military escalation of the same days is a statement by the advisor of the President Aliyev, Ali Hasanov, who, commenting on the arrest of Leyla Yunus, spoke about the existence in Azerbaijan of a group of people – including the same activist – linked to a so called “Armenian lobby”. The crisis between the two countries seems at the moment to have subsided, after a series of meetings held on August 9 and 10 in Sochi between President Aliyev, his Armenian counterpart Sargsyan, and Vladimir Putin. Not without some disturbing details, such as the sambo tournament (a Russian martial art) attended in the evening by Putin, playing the role of a “peacemaker”, and his guests, the two presidents. Starting from those days, there was a return to relative calm on the border, to that state of abnormal normality that distinguished for twenty years the Nagorno Karabakh: a ceasefire continuously violated by both sides without, however, plunging the situation into an open war. Among the few positive notes of these days is a call for peace in Karabakh signed, during the hottest days of the conflict, by various representatives of the Armenian and Azerbaijani civil society, as well as by some international experts. Just a dim light against a sea of darkness?